Let’s play the game of lost and found! Laughing, you should not be as you often play this game on your system, don’t you? Whenever your files are lost then you definitely would have to go through this game. But sometimes it takes so much time to find the files that you may almost fall asleep. Now you won’t need to wait for so much time as you can perform the work in much quicker manner through Instant File Find 1.3 software. 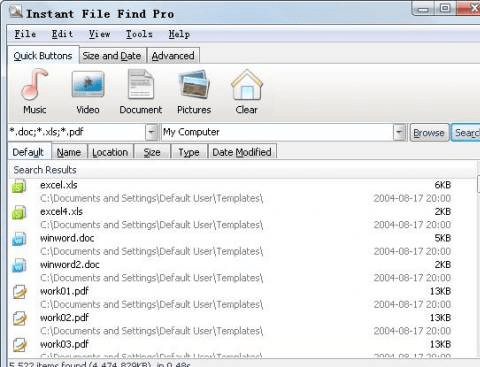 Instant File Find 1.3 software is the best option for making a search as it would let you find the files with its highly effective intelligent searching technique. The software has medium sized screen and has the options for making the search placed on the screen for rapid search. If you’re not in a mood to type anything or want to find all the files of any particular type then the first Quick option is to be used. You just need to click the icon specifying each type of files like pictures, videos, documents, etc. All the specified type of files would be listed in the middle screen. You can even add any category for any new type of files. If you want your search to be more specific then you can make the search by the time, date or size of the file. Making search of files or folders only in a particular drive, etc can be done with the ‘Advanced’ option. Select the source where you want to make the search and the list of the files is gathered in the middle screen. You can save the result so that you need not to perform the work of searching for the files again and again. If in spite of the simple functions you face any difficulty in operating the program you can take the assistance of the help file. The software Instant File Find 1.3 is fast and gives perfect results so has been rated with the 4.5 points out of 5. You can make your search with Instant File Find 1.3 and get the files in few seconds no matter where they are located in your system. Instant File Find is a desktop search tool that lets you find files instantly on your computer. It is designed to speed up your daily work by helping you locate files instantly. With quick buttons, you can list all music or document files ( or other types) on your computer instantly. Quick buttons are customizable, so you can customize your own search toolbar. Instant File Find can sort results by size and date, helping you cleanup hard-drive easier. You can limit results by specify modified date ,size and location.